It was mid-January, and John Galloway was outside wearing shorts and sunglasses. His cheeks were reddened by another perfect afternoon of sun and sport during a two-hour practice session for the Jacksonville University lacrosse team. While the 27-year-old coach embraces the warm winters on campus, it’s not why he rocked the college lacrosse landscape last June when it was announced that he, one of the young legends in the sport, would be the Dolphins’ head coach, and was bringing one of the game’s most famous players, Casey Powell, as his offensive coordinator. That process actually started during the interview process when Galloway saw the commitment from Jacksonville President Tim Cost and Athletics Director Alex Ricker-Gilbert. He found a sweeping and refreshing attitude to elevate the entire athletic department. Their collective vision was persuasive; their enthusiasm was genuine. From the start, Galloway wanted to make Jacksonville University his new home. The Dolphins also hired Powell, a four-time All-American at Syracuse, as the offensive coordinator, and Ryan Liebel and Andrew Keller as assistants. Powell, a true “superstar” of the game (nearly 30,000 Instagram followers alone), was a four-time All-American at Syracuse and the only player to have been named National Player of the Year in both the midfield and attack positions. He began his Major League Lacrosse career in 2001, and heading into the 2016 season, was the all-time leader in MLL scoring with 504 points. Powell was the MLL Most Valuable Player and Offensive Player of the Year in 2014 as well as the Offensive Player of the Year in 2005 when he scored 57 points on the season. He was also a five-time All-Star in the National Lacrosse League Pro Indoor. In addition to his stellar career, Powell has ventured into the business world. His efforts have resulted in the Casey Powell World Lacrosse Foundation, a non-profit organization that exists to unify and energize the entire lacrosse community world-wide. He even has an acclaimed video game, Casey Powell Lacrosse 16, released in January 2016 for play on various home entertainment systems. For his part, Galloway said his decision to choose JU came from his desire to be at a university with strong academics, support from the administration and athletic director and an eclectic social life. JU checked all three boxes. 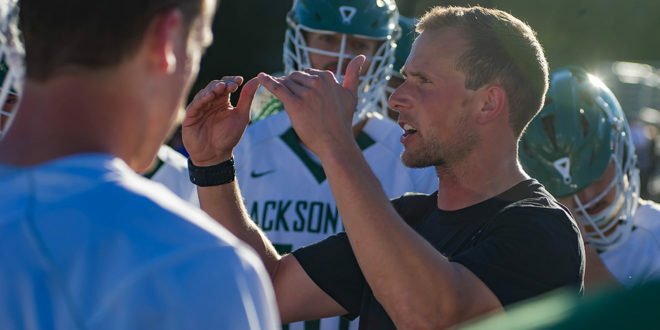 “JU has the Davis College of Business, a niche lacrosse that kids want, as well as the liberal arts program,” he said. “They can explore their own educational program. That was No. 1. The business school really helped. About 80 percent of our guys are in the business school. The second piece for Galloway was the athletic department and the administration. They were both willing to elevate lacrosse to an elite level, he said, and were committed to scholarships and general support of the program on a yearly basis. “And I felt like a kid can come in here and regardless of where he’s from, he has a couple of options. You have the beach. It’s a town where you can really feel comfortable and relax. You can move a little bit west and have a gated campus community. And if you move over the bridge, you have a metropolitan city for internships, job shadowing opportunities, places to explore socially. Ricker-Gilbert was equally impressed by Galloway’s athletic background and his infectious zeal for long-term success. Galloway was a two-time All-American goalkeeper at Syracuse. He won an NCAA record 59 games and played 3,776 minutes before graduating in 2011. He also brings a pedigree that includes two national championships. After college, Galloway played six years for the Rochester Rattlers in the Major League Lacrosse league. He also served as an assistant coach at Duke and Providence before accepting the challenge to forge his own legacy at JU. Galloway flourished in the championship template at Syracuse, but he wants the Dolphins to follow their own direction. It started with a new way to look at an old sport. “We laid down a list of expectations and standards. Everyone knows what we’re looking for. I think it’s very difficult for coaches to come in and throw culture around, throw the word around, but what exactly is that? What are the tangible actions? We’ve really laid that out for our guys so they know on the field the expectations, and off the field, the community expectations. We can tangibly measure whether the guys are living up to our culture,” Galloway said. The new coach’s impact has been sweeping and profound, especially for a team that’s had just one winning season since 2010. “I’ve learned so much. His knowledge of the game of lacrosse is beyond explainable in words,” said team captain and junior Ryan Beville, a midfielder. “He is a very hands-on guy. He doesn’t yell, he coaches and is a mentor. He is extremely dedicated to the game of lacrosse, and it makes all the players learn through him. Former coach Guy Van Arsdale created a solid foundation for Galloway to build upon. There weren’t any bad habits to break, which allowed the new coach to avoid the frustrating pitfalls of a start-up program. Jacksonville has proven to be everything Galloway wanted, if not more. Sunshine has been a welcomed benefit, but the reaction of the players and the administration was everything as promised. “I’ve had a blast. I think, along with both of our assistants, our biggest focus every day is, let’s not do things status quo,” he said. “We’ve all been in different programs, we’ve played and coached in different areas. We need to be really joyful. Content but driven, Galloway is committed to changing the mindset. He believes that, not running, passing, defending and shooting, is the biggest challenge. While at Syracuse, everyone, including the opposition, expected the Orange to win. Galloway believes Jacksonville can someday be at that same level, especially since the climate allows players to work all 12 months – something Galloway couldn’t do in the harsh winters of upstate New York and Rhode Island. “We sell the sunshine. It’s a perk. For us, as a lacrosse program, we can develop 12 months, year-round, while other teams are battling finding field space or being able to manage long practices in the [cold] temperature. We have faced none of those issues,” he said. “It really encourages our guys to get out there and shoot more. For now, Galloway will be patient as the Dolphins develop their own niche in college lacrosse. But it’s clear he will push hard to turn things around a lot sooner than expected. No matter how many bottles of sunscreen it takes. This report contains material from the JU Athletics Department.